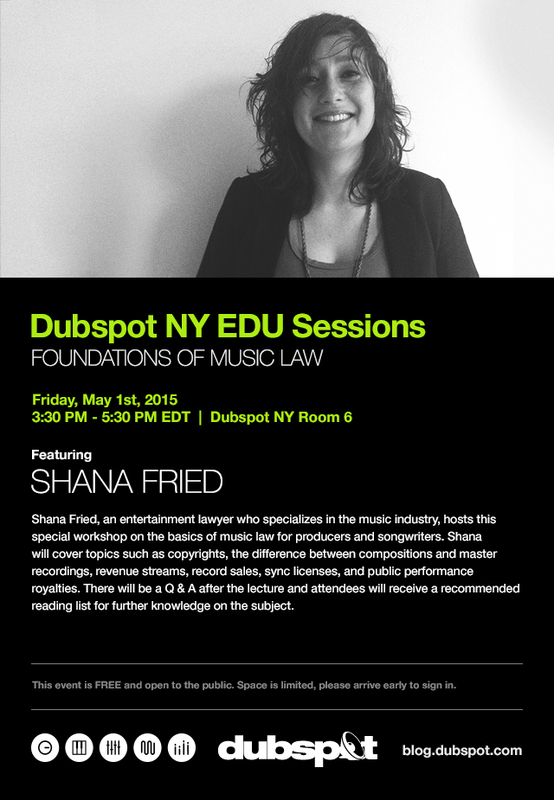 Dubspot NY EDU Sessions: Foundations of Music Law w/ Shana Fried, Esq. On Friday May 1st join entertainment lawyer Shana Fried for an Dubspot NY EDU Sessions workshop about the basics of music law for producers and songwriters. Join us for a free Dubspot NY EDU Sessions workshop about the basics of music law for producers and songwriters, hosted by Shana Fried, an entertainment lawyer who specializes in the music industry. Shana will cover topics such as copyrights, the difference between compositions and master recordings, revenue streams, record sales, sync licenses, and public performance royalties. There will be a Q & A after the lecture and attendees will receive a recommended reading list for further knowledge on the subject.